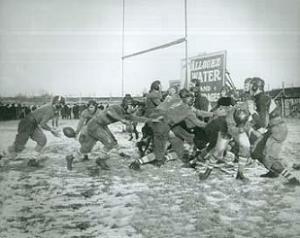 The Packers first home games were at Hagemeister Park, a vacant lot marked with a football gridiron, adjacent to East High. If they felt like it, they either sat in their automobiles or on top of them, but most preferred to get out and follow up and down the field. By moving as play progressed, one always had a "50-yard line" location and was handy to any donnybrook that might require a little help. In fact, when things got exciting, the crowd sometimes spilled right onto the field, surrounded the scrimmage in a big circle and virtually took part in every play. Teams didn't huddle in those days, or the fans would have been in that, too.